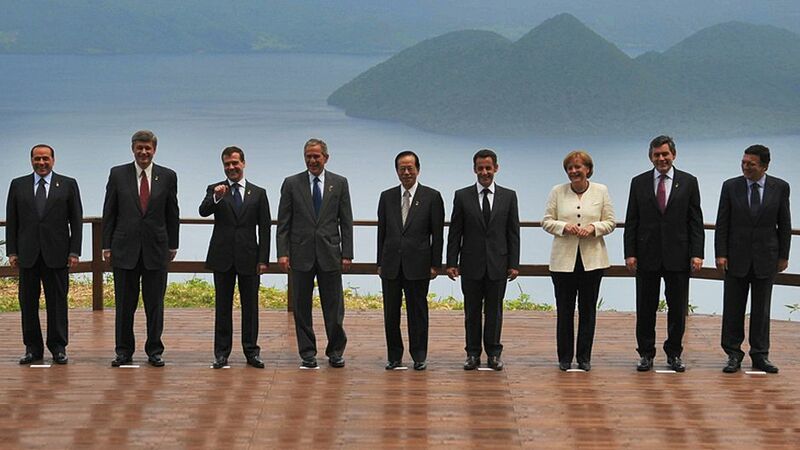 G8 Leaders Family photo - photo by Summit photo Japan. Leaders from G8 countries have gathered in Toyako, Hokkaido to discuss pressing global issues of rising food and fuel prices, climate change, the economy and African development. They will spend three days together, from 7-9 July 2008. The G8 Hokkaido Toyako Summit marks the culmination of one year of intensive meetings across Japan. In total, nine meetings were held from March to June in Kyoto, Okinawa, Osaka, Tokyo, Aomori, Yokohama, Kobe, Niigata and Chiba. An extensive range of topics were covered at these meetings and key decisions have been summarized in statements that feed into the main Summit. The G8 leaders face the major challenge of distilling these messages into a coherent policy framework and plan of action. An interesting overview of the themes to be covered at the G8 Summit has been prepared by the G8 Research Group at the University of Toronto, Canada. Quite clearly, the state of the global economy will be top of the agenda with credit crunch, rising fuel and food prices all adding to the international woes. One main concern here is that the discussions on food, fuel and finances could force other pressing issues into the background and particularly the need to consider the next steps after the first commitment period for the Kyoto Protocol in 2012. In this context, on 4 July 2008, the United Nations University organized a symposium on innovation and climate change that brought together some of the world’s leading climate science and policy experts to discuss the status of the climate change debate and policy options for the future. At this symposium, Dr. James E. Hansen, from the NASA Goddard Institute for Space Studies, called on the G8 leaders to enact a moratorium on and phase-out coal—except where the CO2 is captured. Moreover, Professor Gwyn Prins from the London School of Economics argued that the Kyoto Protocol was essentially flawed and stated that the G8 leaders should support the Cool Earth plan proposed by Japan’s Prime Minister, Yasuo Fukuda. Follow the leaders in Hokkaido, Japan by Brendan Barrett is licensed under a Creative Commons Attribution-NonCommercial 3.0 Unported License.